There’s nothing more hypnotising than a diamond engagement ring that really sparkles in the light, so it’s only natural to want to maintain that brilliance with regular safe cleaning. There are a lot of old-wives’ tales relating to the best ways to clean wedding and engagement rings, but some of these methods are very outdated and could damage your jewellery so it pays to do some extensive research to ensure your beloved ring gets the suited care it deserves. Remember an engagement ring is a symbol of love, treasured for life, and also a potential heirloom. Here’s some guidance around caring for your precious diamond engagement ring. It’s important to remember that each metal needs to be cared for in a different way to maintain its vitality and lustre. Silver is the most sensitive metal as it reacts with different chemicals and can change colour. Gold doesn’t react so much, but does scratch easily and platinum is the most hard wearing of the precious metals. Even though gemstones and diamonds appear to be hard wearing, again this can be chipped and scratched easily, and incorrect cleaning of the fittings can cause stones to come loose from their fittings. The safest way to restore that glow is to soak your engagement ring in warm soapy water for up to 40 minutes, and then to gently massage it with a soft brush to remove any grime. Repeat this process if necessary. Do be careful with how you handle your ring. Always pick up using the band itself, never the stone or setting. Take your ring off at night and keep it on a ring stand, and definitely, take it off if you will be swimming in chlorinated water. Wear gloves when washing up and gardening – treat your diamond engagement ring like the very precious item that it is! Diamonds in particular are extremely hard and strong, so be wary that a diamond can easily cause damage to jewels or even another diamond - remember this while storing your jewellery or if you are keeping your ring in a travel case with other rings. 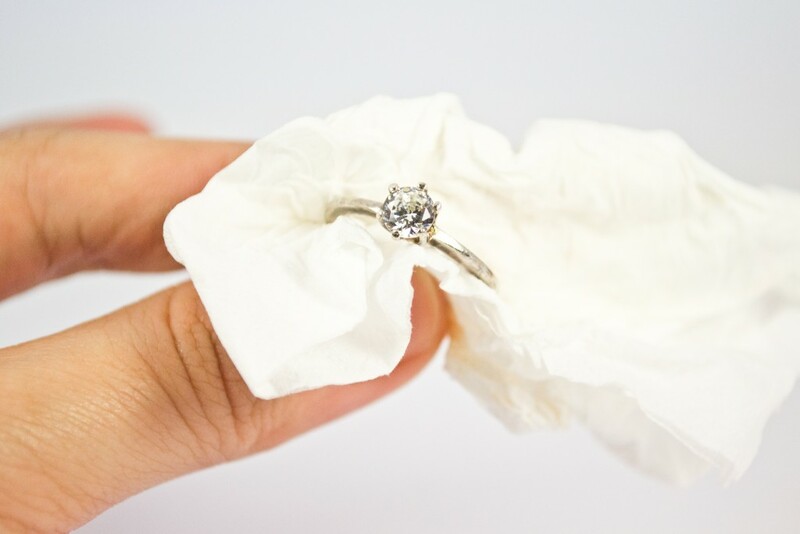 Be sure to buff dry your diamond ring with a soft clean cloth when you can, at least once a week. Use harsh chemicals such as bleach and acetone, these can break down the composition of precious metals. Also, abrasive substances, particularly with a powder consistency can easily cause scratches. Don’t be tempted to try and use any small sharp instruments to pick and scrape out dirt left behind, this runs a risk of causing damage and blemishes to the stone and fixtures. Do not use silver cleaner for anything other than silver- it will dull out gold. Avoid any contact with substances like perfumes, shampoos and makeup as these will dim the rings luminosity. Remove jewelry before swimming as chlorine degrades these metals. Alternatively, you could take your diamond engagement ring to a professional jeweler. This is recommended if a vast amount of dirt is trapped possibly from cooking or outside activities. Taking your ring to a professional is also encouraged if there any signs of wear and tear as they can polish it in the safest way and maintain any repairs-its safety is also guaranteed. After you’ve had your engagement ring for some time, it may not necessarily look like it needs a clean, but you’ll be amazed the difference it will make to the brilliance of the diamonds. If you do feel that your engagement ring has become very dirty, consider taking it to a professional to be cleaned thoroughly.